Until July of 1999, Johnnie Helm, (aka J’ville Johnnie,) had spent the better part of the previous twenty years working full-time in manufacturing facilities in Jacksonville, Texas and performing music part-time in the East Texas area. When his last employer sold the company to a larger corporation from another state, he decided it was as good a time as any to do what he had been contemplating for some time; returning to music as a “full-time” career. 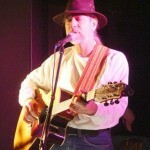 Johnnie began by recording a CD of original songs written during that same time period. The all acoustic project, “When I Hold Her,” was released the third week of January, 2000. He chose to do an acoustic music recording because that was the style of music he had been doing for the past ten years as a soloist and also as a duo act with his wife, Trisha. Playing the acoustic guitar is where it all began for Johnnie. As the title song indicates, holding a guitar is something he has done since age eight or nine when he began learning a few chords to strum along with other musically talented family members and friends. However, he didn’t actually start taking the guitar seriously until sometime during his teenage years when he and his twin brother, Tommie, started entertaining company at home in Pasadena, Texas. That soon led to performing at school, talent shows, parties, dances or any place there was an audience. By this time, rock-n-roll music had become a big influence and Johnnie set the acoustic guitar aside for the most part and played the electric guitar in local bands. Johnnie is no stranger to the “full-time” gig as he and Tommie traveled for five years, 1973 to 1978, with Damascus Road, a Christian music band they started together. The band was headquartered in Jacksonville, Texas where Tommie lived when Johnnie left the U. S. Army in 1970. When the band dispersed in 1978, Johnnie remained in East Texas and pursued music only on a secondary basis. He began to spend more time writing and recording his songs and helping other people do the same through a demo studio he and Tommie built in 1983. He recorded his first solo project, titled Freeway Man, in 1987 as Johnnie Helm and the Elm Street Band. This was basically an electric project completed with the rhythm players from the studio. In 1993, Johnnie was reintroduced to acoustic music by some local musician friends who had a folk music group called Plain Folks. Through the influence of Roland Brown, Sam Smith and Kenny Knous, he was exposed to the singer/songwriter world found at the folk festival in Kerrville, Texas. Since then, he has concentrated on the acoustic style of music because of its convenience; i.e. it doesn’t necessitate a band, although there are some bands such as Plain Folks. Johnnie plays a Cowtown SJ acoustic guitar, with a cedar top, Indian rosewood back and sides, and a Venetian cutaway. The guitar was handcrafted by luthier John Fitzgerald of the Perretta Guitar Company in Dallas, Texas.